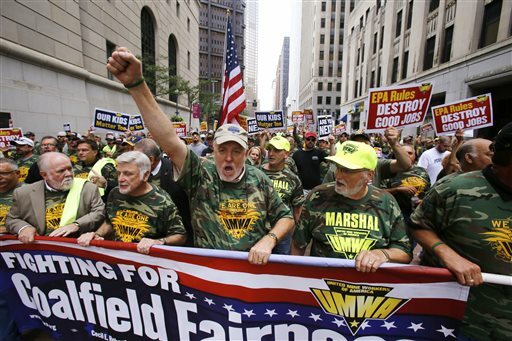 August 1, 2014 by Ken Ward Jr.
Union miners and others opposed to stricter pollution rules for coal-burning power plants proposed by the U.S. Environmental Protection Agency clashed inside and outside the city’s federal building Thursday on the first of two days of public hearings on the new regulations. A few members of a Pittsburgh-based union, Boilermakers Local 154, traded shouts and insults with about 300 environmental activists who stood on a nearby street corner as the march ended. “You’re sending our jobs to China! Use your heads!” one union member shouted. Fourteen UMW members, including international president Cecil Roberts, were arrested for sitting on the federal building’s steps. Union members cheered as police gently led them away in plastic wrist loops. They were to be cited and released for blocking a sidewalk, said mayoral spokesman Tim McNulty. The crisis facing our coalfield communities became all too real just yesterday for up to 1,100 families with loved ones working for Alpha Natural Resources — but a close reading of Alpha’s press release shows that this isn’t just about EPA rules, and our lengthy Gazette story about the many pressures facing Southern West Virginia coal shows that stopping the Clean Power Plan alone simply won’t bring the sort of coal boom that political leaders like to hint is just around the corner if it weren’t for President Obama. Good Evening. My name is Phil Smith. I am the Director of Governmental Affairs for the United Mine Workers of America. As you probably know by now, more than six thousand union members and their families marched through the streets of Pittsburgh today, raising their voices in opposition to this proposed rule. 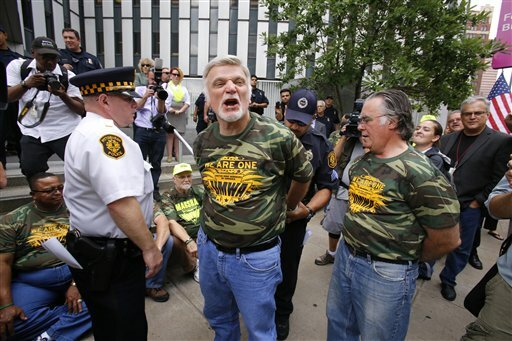 Some of them, including UMWA President Cecil Roberts, UMWA Secretary-Treasurer Dan Kane and the entire UMWA Executive Board were arrested as they engaged in nonviolent civil disobedience on the sidewalk outside this building. All these people came here today because they have serious concerns about the effect this proposed rule will have on their lives. EPA’s own analysis of this rule acknowledges that thousands of coal miners will lose their jobs. That puts their ability to provide for their families at risk. And it puts the retirement security for retired miners, their dependents and widows at risk. That makes them, rightfully, very concerned. And since EPA has thus far refused to hold one of these hearings in the coal producing areas of the country, they had no choice but to come here to make their voices heard. And I assure you, you have not heard their voices for the last time. If EPA does not have the courage to come to the coalfields and look the people who will be most harmed by this and other rules in the eye, then they will keep coming to you. It is important that we put into perspective what this proposed rule does and does not do. The Clean Power Plan is and always was about taking action to reducing greenhouse gas emissions from existing sources. But will it? I have heard some in the environmental community complain that it does not go far enough. I can understand their point, if EPA’s goal is to significantly reduce global greenhouse gas emissions. This proposed rule does not do that. Indeed, it will have a fairly insignificant effect on global emissions, reducing them by about 1 percent. But in exchange for that one percent reduction, tens of thousands of coal miners, electrical workers, boilermakers, utility workers and railway workers will lose their jobs. The pensions and health care retired miners earned through decades of dangerous, backbreaking work will be threatened, if not eliminated entirely. The harmful effect on their families and their communities will be significant. We don’t see this as a fair trade-off. Some say there will be other jobs created that our members can get. But where will those jobs be? What will they pay? What benefits will they have? You are asking people who earn about 27 dollars an hour plus benefits — and believe me, they earn that money working in a coal mine — to willingly give that job up, take the government’s word for it that there will be another job, move away from the place where their families have lived and died for generations, then get retrained to do something that will likely pay much less than they earned before, with few if any benefits. Nor is it likely that this new job will have the protections of a union contract. How can anyone wonder why our members are upset about that prospect? Some have said that the United States needs to take the lead on combatting climate change with this rule. If we do it, others will follow, or so that line of thinking goes. But how do we know this? I am no expert in foreign affairs, but I do know something about economics and the global marketplace. The truth is that rising economic competitors like China and India have welcomed millions of what used to be American jobs to their shores in the past decades. They are able to do that by providing cheap labor and cheap energy. They will continue to have both in abundance for decades to come, and that energy is and will continue to be powered by coal no matter what we do. The UMWA does not dispute the science regarding climate change and the role greenhouse gas emissions play in that. We understand that steps need to be taken to address this issue. Our very real concern is that this proposed rule does not do that in a way that is fair to all Americans and their families. So here are my requests of you today. First, bring these hearings to the coalfields. You have a responsibility in a representative form of government to hear from those who are going to be most affected by this rule. Second, go back and take a look at how you can take meaningful steps in this rule to incentivize the development and application of technologies that will allow our nation to continue to take advantage of its most abundant fuel source, coal. Lastly, don’t destroy the lives of the very people who did what our nation asked of them — providing the coal that for the last 150 years has energized America and provided us with the means to become the most powerful nation on earth. Please, hear their voices. Thank you. July 9, 2014 by Ken Ward Jr.
Roland Micklem and a group of supporters are fasting at the state Capitol this week to protest mountaintop removal mining and its negative effect on the environment. Micklem, 85, isn’t sure he has the strength to see the protest through, but he is adamant in taking a stand and bringing attention to what he said are the evils of invasive mining methods. With blasting already underway for a haul road to serve a new mountaintop removal mine near the eastern boundary of Kanawha State Forest, nearly 200 opponents of the project gathered in a Kanawha City church on Tuesday to discuss ways to rescind the permit for the 414-acre operation before mining can begin. That’s right, nearly 200 people turned out for that meeting. By contrast, a Department of Environmental Protection public hearing on a proposal to re-designate the Kanawha River as a potential source of drinking water drew only a couple of dozen people — that despite the public outcry that followed the contamination of the region’s drinking water by the Freedom Industries chemical spill. Why would anyone protest slurry impoundments? August 21, 2013 by Ken Ward Jr. This morning at 7:30 a.m. two activists paddled out onto the 2.8 billion gallon Shumate slurry impoundment in Raleigh County with banners reading, “Slurry Poisons Appalachia” and “Gov. Tomblin, Put Health Over Profit.” Later this morning, one activist locked himself to a barrel of black water in front of Gov. 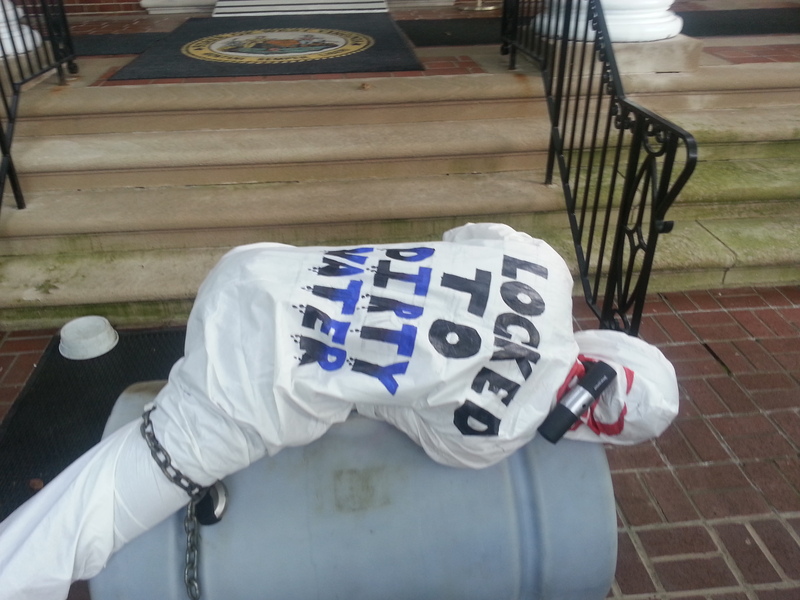 Tomblin’s mansion in a Tyvek suit reading “Locked to Dirty Water”. Activists are calling attention to the failure of the state government to protect its citizens from the abuses of the coal industry and the threats posed by coal slurry disposal. Now, I’ll be the first to admit that I don’t personally relish chasing these protesters around from time to time. I’d rather be working on other things. And this morning, that’s what I spent my time doing — much of it trying to track down some details and analysis to explain to our readers the proposed settlement in the FirstEnergy Harrison Plant transfer case. 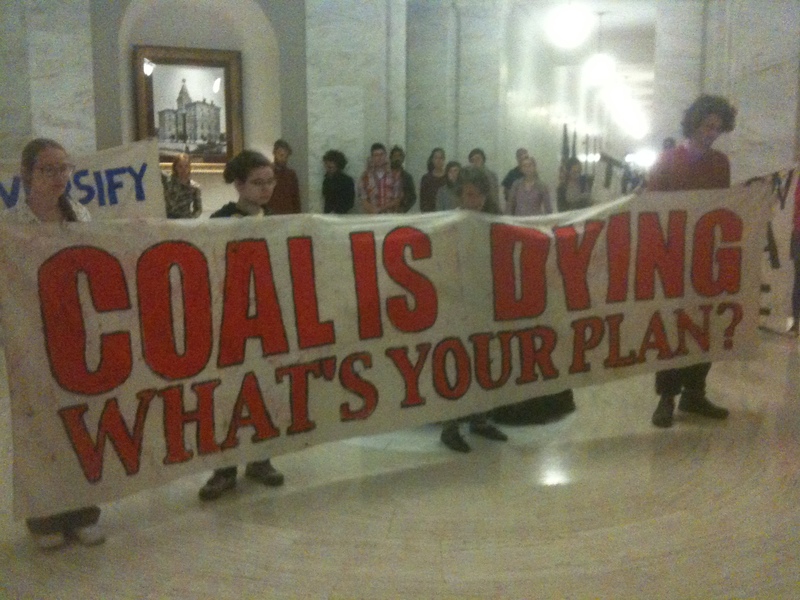 But as we’ve discussed on this blog many times (see here, here and here), there’s a time-honored tradition in the Appalachian coalfields of using peaceful civil disobedience to raise important issues and push for much-needed reforms, especially when it comes to the safety and health of people who work in the coal industry and residents in coal communities. The most recent example involves the repeated protests — and arrests of protesters –– by the United Mine Workers seeking a fair deal from bankrupt Patriot Coal. The Daily Mail gave a blow-by-blow account of the efforts of police to remove the protester from in front of the Governor’s Mansion. But it was kind of interesting to see — fairly well along into the incident — a Republican activist ask the Daily Mail’s Zack Harold what the protest was about. I’m not saying that the protest wasn’t newsworthy, or that giving folks who are into instant updates a blow-by-blow is such a terrible thing … And it’s certainly not such a bad idea to have the media on hand to keep an eye on how authorities treat the protesters. I’ve done my share of coverage watching these protests. But the public also needs to be informed that the stated reason for the protest — outlined in that RAMPS press release — raised some perfectly valid points, serious concerns about the safety and stability of the coal-slurry dams that exist throughout the state’s coalfields. August 2, 2013 by Ken Ward Jr.
Well, the latest police response to the continuing United Mine Workers of America “Fairness at Patriot” campaign event certainly seemed like a bit of overkill, as this letter to the editor of the St. Louis paper suggests (see the photos as well). But it appears that some progress on the Patriot issue is being made in Congress. The legislation introduced today by Reps. David McKinley (R-W.Va.) and Shelley Moore Capito (R-W.Va.) will provide significant help to retired miners and widows whose health care is threatened. The Coal Healthcare and Pensions Protection Act of 2013 will also provide security for the UMWA 1974 Pension Plan, which serves nearly 100,000 pensioners. “I want to thank Reps. McKinley and Capito for introducing this bill, and for their support of the retired miners, their spouses or widows, who through no fault of their own, currently face a loss of the health care they were promised and earned through lifetimes of service in America’s mines. Over the past two and a half years, my staff and I have been working with United Mine Workers of America (UMWA) officials, miners, and retirees in an effort to protect healthcare and pension benefits for our miners. After hearing the stories of what these men and their families face if they lose their benefits, it was clear that we had to find a solution. I am proud to join my West Virginia colleagues in introducing this legislation. We have worked diligently together to craft legislation that addresses the most pressing issues retirees are facing as a result of Patriot Coal Company’s bankruptcy. These hardworking coal miners have dedicated their lives to providing electricity to the Mountain State and building its economy, and we cannot let them down. I will continue to fight for our coal miners and the retirees whose benefits are at risk. July 10, 2013 by Ken Ward Jr.
Thirty people were arrested Tuesday as some 5,000 coal miners and their families protested bankrupt Patriot Coal Corp.’s plans to cut benefits, a plan the United Mine Workers of America says amounts to a broken promise to tens of thousands of workers who made Patriot’s predecessor companies profitable for decades. The rally on a football practice field at Fairmont State University in north-central West Virginia was the 14th protest so far, but UMWA President Cecil Roberts promised there will be many more. The next will be back in St. Louis, where Patriot and several other coal operators are headquartered. We’ve got the whole story online here. May 22, 2013 by Ken Ward Jr.
Photo from Fairness at Patriot campaign Facebook page. Another round of protests involving United Mine Workers of America and their supporters results in about a dozen arrests in downtown St. Louis. Several hundred protesters gathered again Tuesday near the federal courthouse, the site of a recent bankruptcy case involving St. Louis-based Patriot Coal. The protesters were peacefully arrested for sitting in the street. Patriot filed for bankruptcy in July. Protesters are angry about Patriot’s plan to cut health-care and retirement benefits. Patriot says the moves are necessary to keep the company afloat. Similar arrests have occurred at other protests in St. Louis in recent months. Patriot Coal, created by Peabody Energy 2007 with 43 percent of Peabody’s liabilities but just 11 percent of its assets, filed for bankruptcy in July, 2012. Patriot has filed motions demanding the effective elimination of the current system of health care for retired miners and drastic pay and benefit cuts for active workers. U.S. Bankruptcy Court Judge Kathy Surratt-States is scheduled to rule on the company’s motions on or before May 29. April 15, 2013 by Ken Ward Jr. The bankrupt company said the union could then sell all or part of the stake and put the money in the new voluntary employees beneficiary association, or VEBA, that the company has proposed setting up. Under the company’s new proposal, retiree health-care benefits would be moved to the VEBA Trust on Jan. 1, 2014, an extension of six months, if the UMW agrees to a short-term funding proposal. If union leaders agree, UMW retirees and their beneficiaries will continue getting their current level of benefits until the end of the year. While we are working with our financial advisors to fully analyze the amended Section 1114 proposals made by Patriot Coal yesterday with respect to health care for retired miners, their dependents and widows, this appears to be a step forward by the company. There are still considerable problems with the company’s intentions to change the existing contract for active workers under the Section 1113 process. We are nowhere near a fair and just agreement regarding that part of this equation. We continue to believe that an agreement can be reached that provides Patriot with the short-term relief it needs to emerge from bankruptcy, keep people working and become a profitable company again without putting retirees’ lives at risk or demanding the deep sacrifices the company says it needs from hourly workers. We will continue our discussions with the company on these issues. Patriot CEO Ben Hatfield was not at Patriot Coal when the company filed Chapter 11 bankruptcy just five years after it was birthed from the assets and liabilities of Peabody Energy. Hatfield was the CEO of International Coal Group. He said at that time, coal executives were scratching their heads about the formation of Patriot Coal. April 2, 2013 by Ken Ward Jr.
Linda Robinette doesn’t rely on Patriot Coal for her health benefits. But she’s worried what might happen if the company is allowed to cut union-negotiated benefits for retirees. “We are here for a good cause. If Patriot and Peabody get by with this, who will be next?” asked Robinette, whose husband Clarence retired after working at U.S. Steel’s No. 50 Mine in Wyoming County for 36 years. Their health benefits were negotiated under the United Mine Workers of America’s contract with the company. On Monday, thousands of miners, retirees and supporters arrived at the Charleston Civic Center to protest Patriot Coal’s efforts to use bankruptcy filings to strip miners and retirees of health and pension benefits guaranteed under union contracts. The miners traveled from coalfields in West Virginia, Illinois, Ohio, Pennsylvania, Virginia, Indiana and Kentucky. 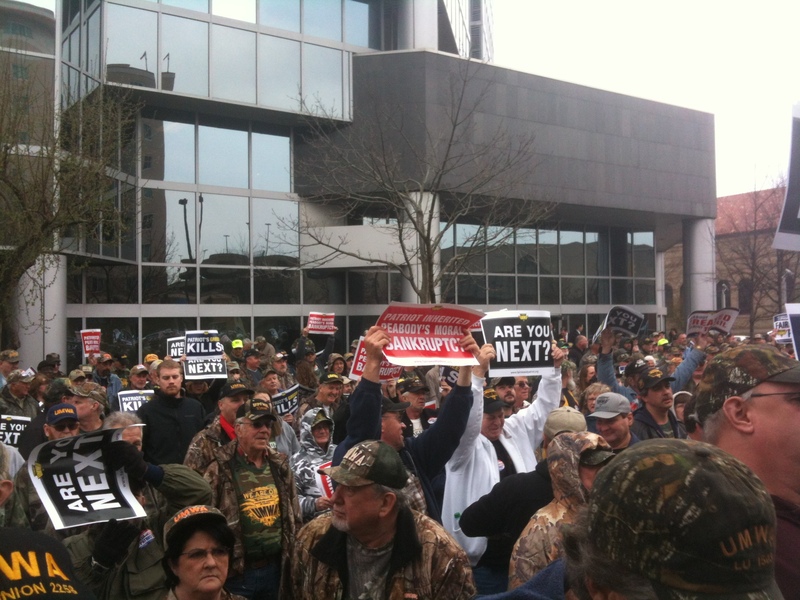 After the rally, the crowd marched to nearby Laidley Tower, where Patriot maintains its West Virginia headquarters. Sixteen marchers, including UMW President Cecil Roberts, were arrested after they sat down on the building’s front steps. Patriot Coal was founded Oct. 31, 2007, when Peabody Coal sold all its union operations east of the Mississippi to the newly created company. 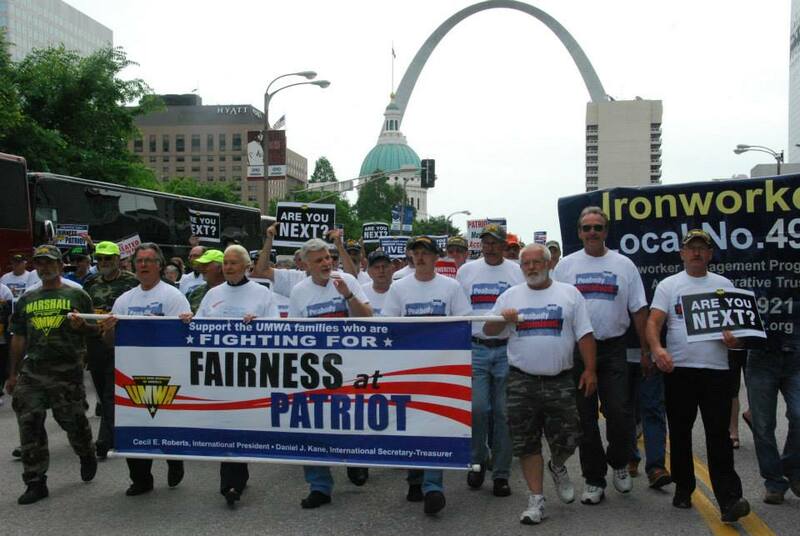 In 2008, Patriot bought Magnum Coal, a company that took over union mines once operated by Arch Coal. 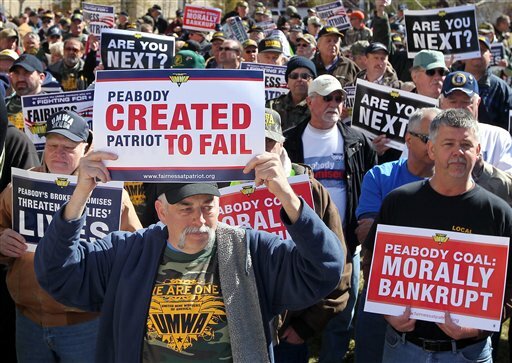 Union leaders have said that Patriot was a “company created to fail,” a way to let Peabody and Arch shed their obligations to union employees and retirees, while reaping the benefits of their largely non-union mines in the western United States. “I worked 36 years as a miner with Arch. I have COPD (chronic obstructive pulmonary disease) and breathing problems,” said Charles Huth of Ava, Ill. “I think Arch should honor their commitment and give us our health care. Huth said he boarded a bus in Illinois at 10 p.m. Sunday to come to Charleston, and would get back on the bus to go home Monday evening. April 1, 2013 by Ken Ward Jr.
I’m just back from listening to a few of the speeches and watching a little bit of the action at the huge United Mine Workers of America rally today in downtown Charleston. 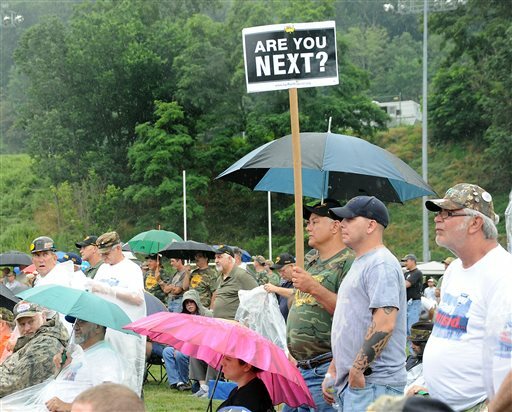 Thousands of miners, family members and various supporters attended the event, held as part of the UMWA’s ongoing campaign to protect its union contract and retiree benefits at bankrupt Patriot Coal. The event began over at the Charleston Civic Center, where they started with prayers, music and speeches for the thousands who drove or rode union-chartered buses into town early this morning. Then, the crowd marched a few blocks over to Laidley Tower, where Patriot maintains a local office. 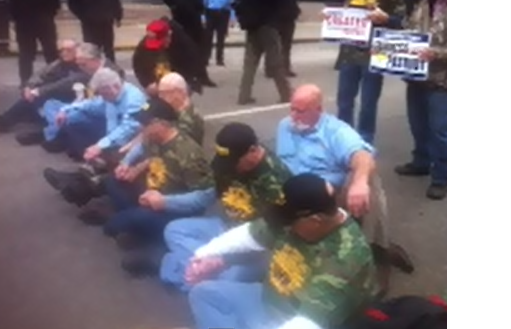 There, 16 individuals — including UMWA President Cecil Roberts and West Virginia AFL-CIO President Kenny Purdue — were arrested after they sat down on the office tower’s steps and refused to move, in another of the union’s series of peaceful civil disobedience protests. Where are all those friends of coal? February 25, 2013 by Ken Ward Jr. 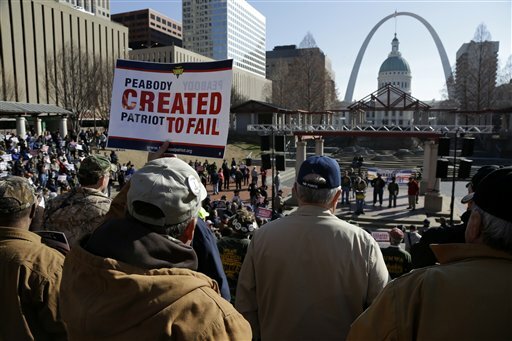 The United Mine Workers plans to continue its protests of the Patriot Coal bankruptcy situation, with another protest on Tuesday outside the headquarters of Peabody Coal in St. Louis. Patriot Coal Corp., which is in bankruptcy-court proceedings, plans to seek to terminate the health benefits of up to 1,000 salaried retirees, according to court filings. During the Patriot bankruptcy most attention has focused on about 22,000 active union miners, union retirees and their beneficiaries who are fighting to keep health benefits. While smaller in number, the salaried retirees could stand to lose more than unionized counterparts. … Many salaried retirees—including foremen, superintendents and other supervisors—worked alongside unionized miners in underground coal mines for decades but don’t have protections guaranteed by collective bargaining agreements. In December, Patriot sent a letter to salaried retirees saying it intended to terminate all of their retiree health and life-insurance benefits. A hearing is scheduled for Tuesday in U.S. Bankruptcy Court for the Eastern District of Missouri to create a committee to represent salaried retirees’ claims. “In this case the company is saying we want to terminate 100% of your benefits, and we don’t want you to have any unsecured claim,” said Jon Cohen, a Chicago attorney representing the retirees. February 13, 2013 by Ken Ward Jr. 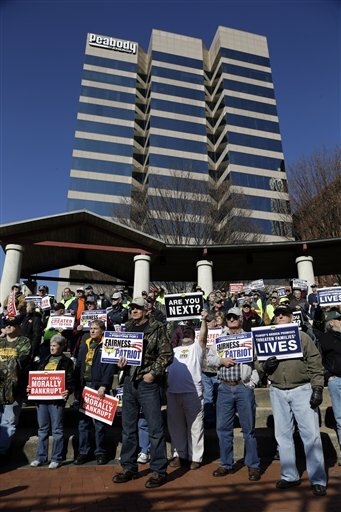 Protesters from the United Mine Workers of America picketed this morning outside the headquarters of Peabody Energy. That’s one of the companies the union accuses of orchestrating business deals that bankrupted Patriot Coal. The protest ended before noon and 10 people were arrested. According to a statement from Patriot Coal, the company’s CEO and executive team will not participate in the retention and annual incentive plans filed yesterday. You can read the court filing here. January 29, 2013 by Ken Ward Jr.
Judging from the online video stream (from which I pulled the above photograph) from the United Mine Workers of America protest at Peabody Energy headquarters in St. Louis today, it looks like some folks might soon get arrested. UPDATED: Read the latest on the arrests here. Mike Elk from In These Times has been live-tweeting the event, and you can follow the UMW’s Fairness at Patriot Campaign here or here. But buried in the news about the protest, UMWA President Cecil Roberts for the first time revealed some details — though only a few of them — about exactly what Patriot has proposed to do regarding its union contracts and health-care benefit plan (see previous posts here, here and here). Until now, these details have been discussed only privately during union negotiations with Patriot, and the actual proposals haven’t been filed publicly yet in bankruptcy court. People would still lose their health care. What we have here is a company reneging on its promises. We’re not going to take it. We will fight for our members and their families in the courts, in the coalfields and in the streets of St. Louis. Patriot and Peabody have a moral obligation to those who mined their coal. January 23, 2013 by Ken Ward Jr. Seven people, including at least one West Virginian, locked themselves to a 500-pound potted tree inside Arch Coal’s headquarters in Creve Coeur, Mo. on Tuesday in a protest against strip mining. A larger group performed songs and dances in the building’s lobby, according to the protesters, who are affiliated with the groups Radical Action for Mountain Peoples’ Survival, Missourians Organizing for Reform and Empowerment, and Mountain Justice. “We’re here to halt Arch’s operations for as long as we can. These coal corporations do not answer to communities, they only consume them. We’re here to resist their unchecked power,” Margaret Fetzer, one of the protesters, said in a news release. October 24, 2012 by Ken Ward Jr.
I’m just back from the Capitol, where a couple of dozen citizens were trying to talk with West Virginia Gov. Earl Ray Tomblin about the lack of focus by state officials on planning for the ongoing decline in the state’s coal industry. Protesters, organized by the group Radical Action for Mountain Peoples’ Survival (RAMPS), first knocked on the door of the governor’s mansion. A State Police trooper who answered the door declined to accept a letter to the governor, so the group walked next door to the Capitol. There, an aide at the governor’s office did accept their letter. The group held up some signs, one protester sang a song, they talked to the media, and then they quietly left. There were a lot of troopers and Capitol police on hand, though, that’s for sure. … You face a clear fork in the road if you are to win a new term as governor of this state. Do you continue to bow to the demands of a ruthless industry in decline, or do you enact solutions that address the coming dire economic reality of the people that live in the southern coalfields? Instead of confronting the very serious issues facing southern West Virginia, you have cynically exploited layoffs in the coal industry to boost your election chances. By fanning the flames of this supposed ‘war on coal’, not only have you lied to coal miners about the real reasons they are losing their jobs and created false hopes, you have increased divisions in our communities and helped incite violence against anti-MTR activists. The letter urges Gov. Tomblin to create a non-partisan Citizens Advisory Council on Economic Diversification to advise his administration on a plan for the state to move forward. I’ve posted a copy of the letter here. I’ve asked the governor’s office for a response … I’ll post whatever they have to say about this. The governor had an event in Buckhannon late this morning so he did leave the mansion this morning a bit before 9:30am. We did receive the letter, however, the governor has not had a chance to review. I am having a copy sent to me now. In addition, we do have an open door policy here in the governor’s office and will be happy to review the upcoming calendar. Governor Tomblin has been clear, as have several federal judges, on the overreaching demands of the EPA from this administration. 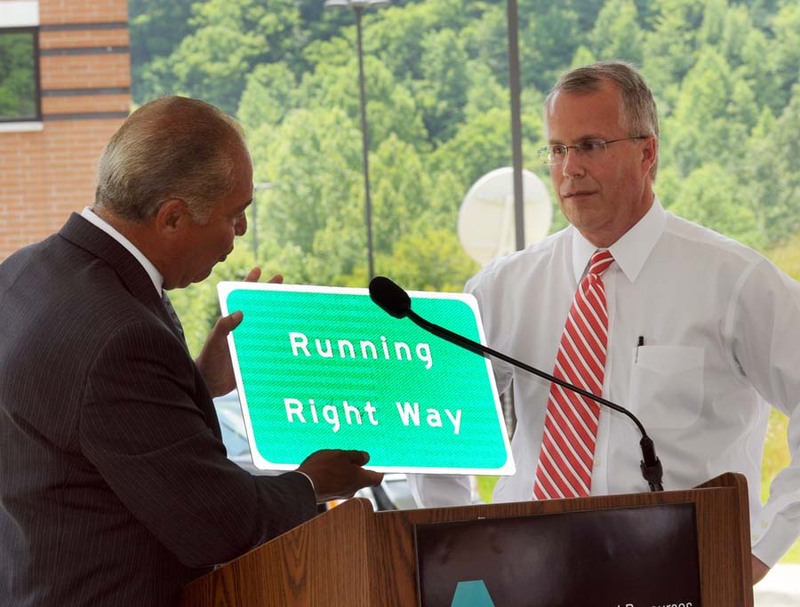 Governor Tomblin’s primary focus has always been job preservation and job creation. Governor Tomblin believes strongly that West Virginia coal and natural gas play a critical role in energy independence–and he will continue to fight for those industries and the jobs they create. 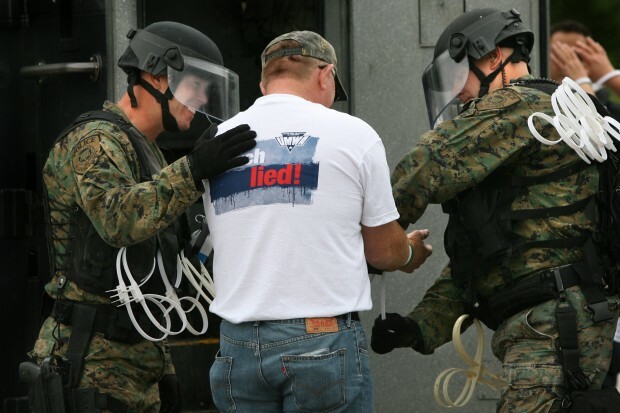 August 2, 2012 by Ken Ward Jr.
Environmental activists demanded a federal investigation Thursday into the alleged beating of a mountaintop removal mining protester by West Virginia State Police. Several groups issued a statement asking the U.S. Attorney’s Office to investigate a weekend incident involving mountaintop removal mining protester Dustin Steele. They’d initially targeted the West Virginia attorney general, but that office has no criminal investigation or prosecutorial power. It primarily handles consumer protection and fraud cases. Federal prosecutors didn’t immediately comment. Steele, 21, is a Matewan native who now lives in Blair. 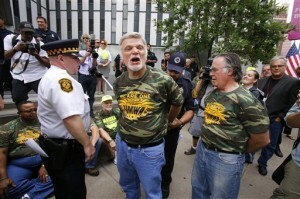 He and 19 other protesters were arrested Saturday after a demonstration at Patriot Coal’s Hobet mine in Lincoln County. Steele told The Associated Press he was dragged across asphalt outside the Madison State Police detachment, then punched and kicked by several troopers. Sgt. Michael Baylous said State Police officials have received no complaint from Steele, so they’re not doing an internal investigation. He did not immediately comment further. Melvin Smith, a spokesman for the U.S. Attorney’s Office, said the FBI investigates claims of civil rights violations by public officials, but he was unaware of whether it’s received any complaints. If the FBI were to determine charges were warranted, they would be pursued in federal court. Coal protest: Was this really so radical? 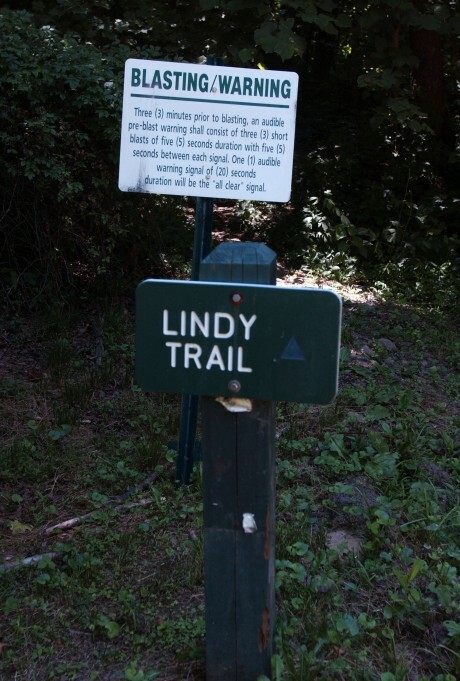 July 31, 2012 by Ken Ward Jr.
Matthew Louis-Rosenberg, a Sandstone resident and the group’s spokesman, alleges that State Police cooperated with coal supporters and miners who showed up to intimidate them. State Police spokesman Sgt. Michael Baylous said police support an individual’s right to protest and showed no preferential treatment in enforcing the law. He alleges that one member, Dustin Steele, 21, of Matewan, was assaulted by law enforcement while in custody. Louis-Rosenberg was unsure which agency allegedly carried out the assault and hoped to learn more by speaking to Steele. An independent journalist also was arrested before Saturday’s protest. Babette Hogan, 52, of San Francisco, told the Sunday Gazette-Mail she was taking photos from the passenger seat of a vehicle on Kanawha State Forest Drive when a trooper demanded her camera. When she refused, Hogan was arrested and charged with obstruction, she said. Now. all of the facts aren’t in yet. And there is no question that being a police officer is made more difficult when citizens decide to break the law to make a political point — especially when in doing so they potentially put their safety and the safety of hard-working coal miners at risk. But the West Virginia State Police have plenty of other things to worry about, and given the State Police’s formation a century ago to essentially help put down the unionization efforts in our state’s coalfields, it’s vitally important that the agency not only neutrally enforce the law, but also ensure that everyone walks away from these sorts of potential confrontations without getting hurt. Perhaps Gov. Earl Ray Tomblin will call in his State Police leadership and investigate what happened here, to ensure the agency is truly out to protect everyone’s right and safety, and ensure that the media’s ability to gather the news is also protected, even from troopers who might not like having their picture taken. May 24, 2012 by Ken Ward Jr.
Mountain Justice and RAMPS activists blocked coal transport in two locations Thursday morning. Five boarded a barge on the Kanawha River near Chelyan, with a large banner that read “Coal leaves, cancer stays,” and locked their bodies to the barge. At the same time, dozens of concerned citizens obstructed access to the haul road on Kayford Mountain, stopping coal trucks from entering or leaving the Republic Energy mine. 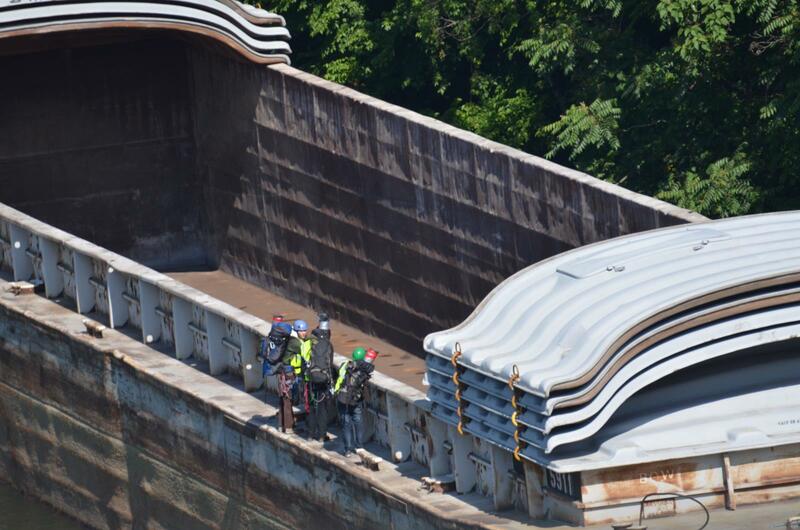 “These actions against coal transport were taken because the viability and health of mountain communities are being destroyed by mountaintop removal—the coal and the profits are shipped away, leaving disease and destruction in their wake,” Rebecca Loeb, one of the people on the barge said. August 18, 2011 by Ken Ward Jr.
Catherine-Ann MacDougal is descending her oak tree on Coal River Mountain that she has lived in for the past month in protest of strip mining, and police have been notified. MacDougal, an activist with the RAMPS Campaign, had been in the oak tree on Alpha Natural Resources’ Bee Tree permit since July 20; until August 2, she had been joined by fellow RAMPS activist Becks Kolins. Their tree-sit, the longest in West Virginia history, effectively halted blasting on the Bee Tree hollow portion of the site, aside from a small blast released on the third day of the tree-sit. August 3, 2011 by Ken Ward Jr.
A mining protester has ended her treetop sit-in at an Alpha Natural Resources mine on Coal River Mountain and is now charged with trespassing. 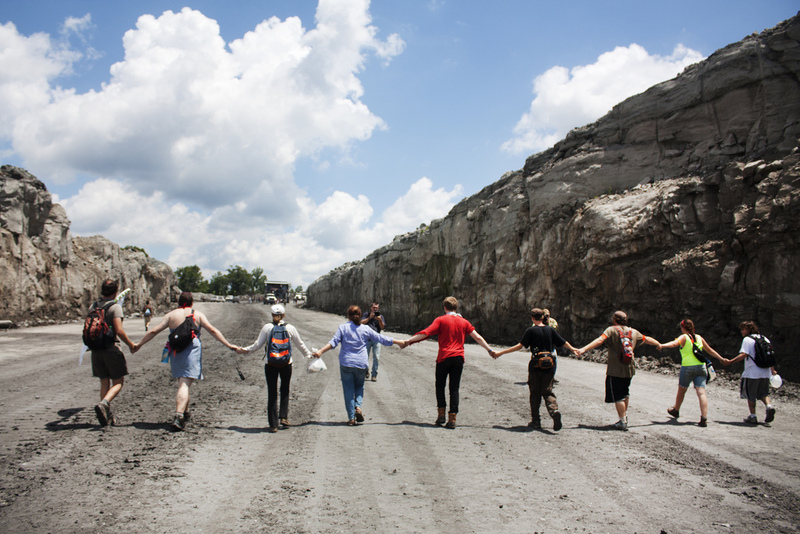 Becks Kolins and Catherine-Ann MacDougal climbed into platforms July 20 to protest operations at the Bee Tree surface mine. They’re affiliated with Radical Action for Mountain People’s Survival. Kolins descended Tuesday. McDougal says she’s staying put. The group’s website also includes an account of a recent citizen inspection of the operation. July 27, 2011 by Ken Ward Jr. In late May, eight residents from coal mining areas of southern West Virginia and southwestern Virginia, including one of us, met with you about Alpha Natural Resources’ takeover of Massey Energy. Residents discussed the devastating impacts of mountaintop removal mining, including the documented connections between mountaintop removal mining and degraded water quality, flooding, and serious public health impacts, including elevated cancer rates. In the 570,000-acre Coal River watershed, nearly a quarter of the land area is being mined or permitted to be mined in the future, including over 5,000 acres of Coal River Mountain. At the meeting, residents requested that Alpha make specific changes to reduce the impacts of the Massey operations that it has inherited. Alpha was specifically asked to halt blasting near the Brushy Fork coal slurry impoundment which is located near the Bee Tree permit where we are sitting in trees. This is the only active mountaintop removal permit on Coal River Mountain, and we share residents’ concerns that the blasting on this permit is weakening the structural integrity of the impoundment. Failure of the impoundment could kill a thousand people living downstream according to Massey Energy’s figures. Within the past month, the Brushy Fork impoundment has come under increasing scrutiny, with the federal Office of Surface Mining Reclamation and Enforcement issuing a 10-day notice for failure to prove that the dam was sufficiently safe from liquefaction. Given the lack of public response and decisive action from you in regard to our request to end strip mining on Coal River Mountain, and the continued safety concerns surrounding the Brushy Fork impoundment, we see no other alternative then to take direct action. We look forward to your response.